Elena Kagan's professional background doesn't reveal her stance on abortion laws. Washington (CNN) -- First trimester abortions are legal and constitutionally protected, thanks to the 1973 Roe v. Wade high court ruling. But the current court has proven deeply divided whenever the issue arises, so it is possible a single change in the court's makeup could affect future cases dealing with access to the procedure, and the government's power to regulate it. There are probably five votes on the bench to impose further, narrowly tailored restrictions on access to abortion, but not a majority to actually overturn Roe. There is not much in Elena Kagan's professional background on the issue. As an undergraduate at Princeton, she wrote a class essay deriding conservatives as "these avengers of 'innocent life.'" While a law clerk to Justice Thurgood Marshall, she was asked to offer advice on whether the court should accept for review an appeal on prisoner access to abortion. At issue: Does the Constitution require a local sheriff's office to pay for female inmates seeking abortions that are elective or "not medically necessary"? A lower court said yes. Kagan wrote to Marshall, "Quite honestly, I think that although all of this decision is well-intentioned, parts of it are ludicrous." But for pragmatic reasons, she urged the justice to reject the state's appeal. Kagan lamented the court would probably take the appeal regardless, and warned, "It is likely to become the vehicle that this court uses to create some very bad law on abortion and/or prisoners' rights." She was wrong. The court rejected the appeal. However, it heard a similar one a few years later, and said prisoners have no automatic right to elective abortion services. 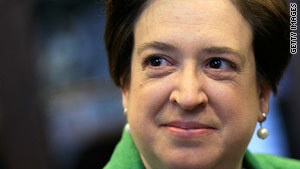 Video: What's ahead for Elena Kagan? Judiciary Committee Sens. Jeff Sessions and Jon Kyl this month criticized her 22-year-old memo, saying Kagan took a political approach to deciding legal questions rather than looking at them on their merits. The abortion rights group Center for Reproductive Rights also labeled as "troubling" Kagan's conclusions in that 1988 note. The group also expressed concern over Kagan's policy views on abortion when she worked in the Clinton White House. The controversy 13 years ago was a pending bill in the Republican-controlled Congress that would ban a type of abortion performed in the second trimester. Critics of the procedure called it "partial-birth" abortion. In one memo, Kagan added her thoughts in a letter the White House was sending to a Catholic bishop who wanted the ban. "I support an exception that takes effect only when a woman faces real, serious health consequences," Kagan wrote. The reproductive rights center in a June 21 report criticized Kagan for supporting what it labeled a "too-narrow health exception" to the legislation. Her recommendations "would have had harsh consequences for women seeking abortions, and were unconstitutional under then-prevailing law," said the center's report. In a February 27, 1997, memo to top White House staff, Kagan noted a leading abortion rights supporter had just admitted late-term abortions were being "performed more frequently than pro-choice groups have acknowledged, and often ... on healthy women with healthy fetuses," repeating a claim conservatives at the time had long made. Kagan advised "it would be a great mistake to challenge" the statements of Ron Fitzsimmons, then executive director of the National Coalition of Abortion Providers. Nonetheless, Kagan said the controversy did not undermine the president's stated position that he would support the GOP bill with some exceptions. "The president's position today remains what it has always been," wrote Kagan, "that he will sign a bill banning partial-birth abortions, but only if it has an exception that will protect those women -- even if few in number -- who need this procedure to save their lives or prevent serious harm to their health." The Supreme Court three years ago affirmed a similar federal ban on the procedure, passed by Congress in 2003. That bill did not include a "health exception." Kagan in her memos at the time repeatedly used the term "partial-birth" favored by anti-abortion groups -- one which abortion-rights activists had tried to replace, believing it was inaccurate and inflammatory.